The Rosetta spacecraft has discovered molecular oxygen in the cloud of gas surrounding the comet it is tracking. The discovery has come as a complete surprise to scientists who thought that oxygen would have reacted with other elements as planets were forming. The results indicate that current ideas about how our Solar System formed may be wrong. The study has been published in the journal, Nature. Researchers used Rosetta's Rosina instrument to "sniff" the atmosphere around Comet 67P/Churyumov-Gerasimenko, as the probe trailed the icy body over a six-month period. They found that free oxygen was the fourth most common gas around the comet, after water vapour, carbon monoxide and carbon dioxide. "When we first saw it, we went a little bit into denial because it is not what you would expect to find on a comet," she said. Many current theories of how the planets and comets formed around the Sun suggest a violent process that would have heated up the frozen oxygen - which would then have reacted with other elements. The suggestion is that the Solar System formation must have been an altogether quieter affair. "If we have O2 at the beginning of the formation of the comet, how did it survive so long?" said the study's author Andre Bieler, from the University of Michigan. "All the models say it shouldn't survive for so long, which tells us something about the building of our Solar System - it has to be very gentle to build these ice grains, it seems it is a pretty pristine material still. 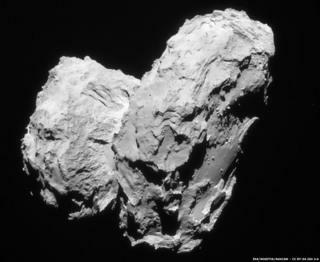 BBC iWonder: Did comets kick start life on Earth? In November last year, the Rosetta mission made history by orbiting a comet and landing a small probe on its surface. Contact with the probe was lost a few days after a crash-landing, but the orbiting spacecraft has continued to send back a wealth of data.